We welcome you to the webpage of Tucson, Pima East Vicariate Chapter. These are exciting times that we live in and Magnificat was begun in 1981 for such as time as this. There are now over 100 chapters throughout the United States and its territories and in many foreign countries. Father Abram Dono was born in Brooklyn, New York, in 1936. He has four brothers and one sister. Fr. Abram entered St. Joseph Preparatory Seminary located in Holy Trinity, Alabama, in 1952 for his sophomore year of high school. He was fulfilling a dream of becoming a priest and a missionary that he’d had from his earliest years. During his seminary years, Father Abram was known for organizing dramas and for planning and executing shows for the entertainment of all at the seminary. 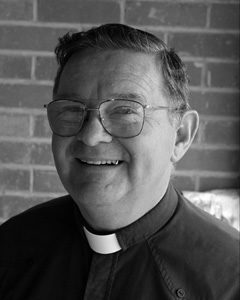 One of his fellow missionaries once said of him, “If he had not become a priest, he would have been an actor!” This talent has served him well as a priest leading celebrations and Masses. In the 1990’s he returned South where he was assigned pastor of Holy Rosary Indian Mission, Tucker, Mississippi, where he ministered to the Mississippi Band of Choctaws. Currently, Father Abram works with Native Americans at our St. Kateri Tekakwitha Parish in South Tucson, Arizona. Tucson Chapter of Magnificat’s Spiritual Director, Fr Dono, will share lenten insights and experiences from his recent pilgrimage to the Holy Land. Please join us. Magnificat Proclaims. Join us and see how God continues to transform us all through His “lesson plans”. The evening is designed to speak to the hearts of women. Cost: $15 per person if postmarked by 4/8/2019. Use form below to mail in reservation. All Clergy & Religious are Complimentary – Call (520) 237-7060 to confirm your attendance. For questions or reservations: call Gloria Roberts, (520) 237-7060. Remember our chapter’s commitment to Eucharistic Adoration and to pray the Rosary on the 20th of each month for the intentions of Magnificat, Sanctity of Life, Marriage and Family, and World Peace. If you would like to help with a Ministry of Magnificat, or if you have a question or comment for our Service Team, or if you would like to be on our Mailing list for future events, please contact us at gmroberts@cox.net. In 1991, Tucson’s Director of the Charismatic Renewal became aware of the Magnificat group in New Orleans. He felt strongly that the women in his diocese should have the same opportunity for spiritual growth that this organization provided and began a search for spirit-filled women who would dedicate themselves to the pursuit of establishing a Chapter here. A Team was formed led by Elizabeth Celenza and the 18th Chapter of Magnificat was officially licensed in October 1992. Elizabeth served as Coordinator for 25 years. The Chapter has been blessed with three different spiritual directors and many awe-inspiring speakers over the years who have ensured a very meaningful experience for those who have attended their Breakfasts. In addition to the quarterly Breakfasts, the Tucson Chapter has sponsored Life in the Spirit seminars, Bible Studies and mini-retreats to enliven the spiritual lives of women.